What are the various technologies and tools needed to actually build data worlds? From the previous basic architecture, let’s expand the architecture with more detail. The flow is still left-to-right with Data-Design-Render-Display. Data consists of a Data Provider (managed SQL-like access) and DW/DL combo. The data flow (in blue) is primarily metadata (attribute names, typing, counts) for multiple SQL views as tidy data (observations and variables in 3NF) used for the data world. 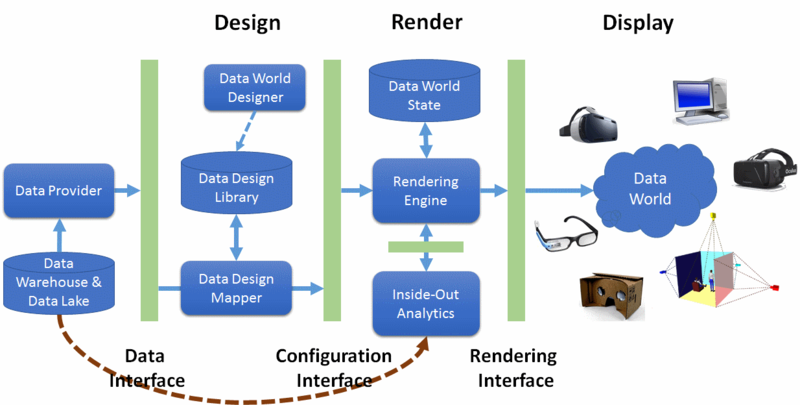 Previously, the data world is designed with the Data World Designer that stores the configuration that maps each view to an in-world data object. The designer chooses from a library of various types of data objects to highlight aspects of the data. The view plus configuration flows to the Rendering Engine, which generates the 3D virtual space to be consumed by various immersive display devices. The unique twist is the Inside-Out Analytics, which directly accesses the data stores (via curved arrow) and performs a specific analytic on a specific data view. Both the results and processing dynamics of the analytic are rendered in-world. There is much more detail required to build a data world. The challenge is sorting, organizing and implementing the various combinations of components – data sources with rendering engines with analytics with display devices. Below is a table listing some possibilities for the various components. The best way to advance the thinking about IA is to build and build more data worlds. By experimenting with various combinations of design styles, rendering engines, rendering displays, and open datasets, we should discover practical use cases and effective design strategies. However, we should also expect that our initial assumptions and goals will soon prove to be naive and adjust accordingly. An approach that has been fruitful for other software communities is to define a minimal architecture for a Hello Data World so that more persons can quickly created their own data world and then customize it to their interests. Over time, a gallery of these Hello Data Worlds will be available in source/execution form for download.